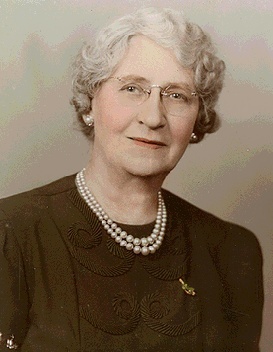 A Valentine's portrait of Mabel Marshall for her husband in 1941. My mother was born Mabel Melody. Her last name was Melody. Her parents were Irish. They were both born in the U.S. in Boston. She was born in San Francisco, April 2, 1879. She grew up in the Potrero where many Irish had settled. 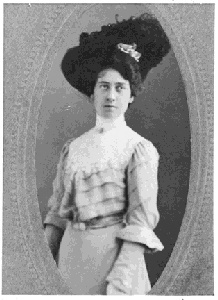 Mabel Marshall in her wedding portrait in 1902. She married my father who was from Liverpool, England. He was 15 years old when he came to U.S. His father came a year or more earlier and became a citizen which allowed my father to become a citizen also. They married in 1902. At that time he was working at the Emporium as an electrician. My mother had graduated from Polytechnic High School and was working at the Bush Street telephone office as a supervisor. She quit when she married and they had a flat on Steiner Street where they lived during the earthquake. My grandfather Marshall was a tea taster for the Great American Tea Co. Later he had his own grocery store. My grandfather Melody was an Engineer on the Santa Fe Railroad. After the earthquake my family moved to a flat on Dolores Street. In 1916 when I was 9 months old we moved to 1224-l6th Avenue. a two-story six-room house which we rented. In 1924 we moved and bought 1232-16th Avenue, which is the picture I sent. It had seven rooms, two stories. After WWII, being alone, my mother moved to an apartment at 16th and Lincoln Way, just across the street. She lived there where she died at age 96. She preferred to stay close to Golden Gate Park. There is no denying that much has changed in the world-renowned city of San Francisco since World War II. No longer present in this glamorous, panoramic, historical metropolis is the well-regarded matron, fittingly defined as a typical San Franciscan. This native born woman had a deep abiding love of her famous city by the bay and would rather live within its limits than anywhere else. New developments in the suburbs never tempted her from her native soil, where she preferred to live and where God willing, she would die. Her distinctive characteristic style, friendliness, generosity and goodness charmed all who met her. She was the mother of children of the 1906 Earthquake and Fire and of the Great Depression as well. The experience of these disasters did not change her attitude toward this remarkable city. To abandon it would have been unthinkable and her love was only strengthened by the impact of the calamities it suffered. She delighted in the diversity of her surroundings long before politically correct became the buzzword of an activists crusade. She would sing the praises of the merchants in Chinatown with shops of beautiful jade and rare silk. Weekly trips were made to North Beach delicatessens to sample fine Italian cheese and spicy condiments. The general hubbub and foreign atmosphere of the neighborhood was an excitement she could not resist. She was well educated and appreciated the historical link of Mexican culture with the City of Saint Francis in place names, architecture, art and food. No matter where her destination or whatever her purpose, she would never leave the house without being properly clothed. A hat and gloves were always worn with the outer garments. Sometimes a luxurious fox fur or a mink stole would be added for extra warmth. Her usual mode of transportation was the streetcar or cable car with a five cent fare. A visitor, by chance sharing a seat with her, would be most grateful for the company of someone who would with tremendous pride point out spectacular views along the route, in case they might be missed. This matron decked out in her citified finery, has become a legend of history herself with her everlasting pride in a noteworthy and fabulous city. The decline in dress and social protocol of today would be considered an embarrassment. Amazement and shame would be felt at the indifference of a no longer polite society. The rough and uncouth language of the present population, not only of the young, but of those educated masses who should know better, would be found disturbing. The phenomenal Summer of Love and the invasion of the Haight-Ashbury by the hippie counterculture would be looked upon as disquieting but temporary. It was bound to run its course. Many may find amusement in the appellation of typical San Franciscan. They will argue that it is illogical and obsolete. Some declare that San Franciscans in general are now devoted to individualism, which is expected to lead to greater progress. This may be true, but this matchless icon is a composite matron who embodies all the traits admired as important in her time. Those of us who inherited our roots from this admirable woman will love and cherish her as a loyal and devoted daughter of the City of Saint Francis.